My first game is finally done! You are a cannon and your mission is to destroy the red targets. For every level you get five bullets to finish the job. If you fail to do so, you have to start all over again. There are ten levels in total and at the end there is some nice fireworks for the winner! When I began, the concept of the game was already pretty clear to me. I wanted to create a shooting game with mechanics like Angry Bird. I also knew that in order to keep the controls simple, I would use a static ‘player’ to shoot the bullets from. Also much like Angry Birds. The idea was to finish this game within a month. I started in the second week of February as you can see in the GitHub contributions calendar. After the first month it became clear that I was not going to make the deadline. It really didn’t bother me much, because I was finally creating a real game. Way better than not creating a game at all. Then after the second month the game was still not finished and I started to lose some motivation. The game was pretty much working, but it wasn’t really a game yet. One of the biggest flaws was the levels. I had a hard time coming up with original and challenging level design. Using Tiled (see below) helped a to simplify the process, but the creativity was lacking. Together with my vacation in Cuba in April and the FIFA World Championships in June/July my motivation dropped significantly as it shows clearly on the calendar (I did some coding on my old Samsung netbook N210 on the airplane, though :). At the end of July I decided that I really need to finish this first game in order to continue my challenge again and after some serious gold-plating of the app icon I finally completed my very first game! 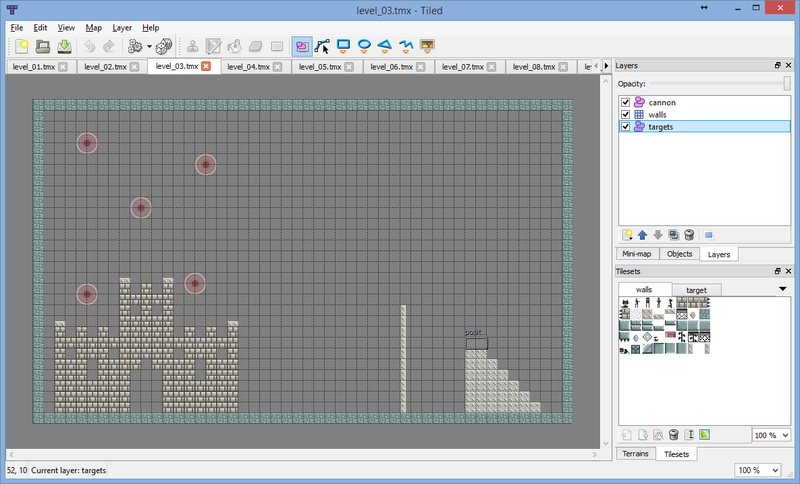 To build levels easily I used Tiled Map Editor. There is a HaxeFlixel demo which loads a map created with Tiled. I used the code for my game to load the position of the cannon, targets and the background. Because I am not a designer/musician I used some great websites to find free-to-use graphics and audio. Overall it was a very exiting process. Compiling to the different platforms in haxe has worked perfectly so far and the is already released in the Google Play store. Please leave your thoughts here and see you soon for the next game!